Professor Pasko Rakic, the Dorys McConnell Duberg Professor of Neuroscience and Professor of Neurology, Yale School of Medicine has been selected as the 2019 recipient of the Connecticut Medal of Science. Rakic’s selection reflects his considerable contributions as a transformative neuroscientist credited with establishing fundamental molecular and cellular mechanisms for the development of the cerebral cortex, the most complex structure in the universe. He will accept the award at the 44th Annual Meeting & Dinner of the Connecticut Academy of Science and Engineering, to be held on May 28, 2019 in Cromwell. Professor Rakic’s discoveries have profound implications for neuropsychiatric disorders, the most disabling medical conditions worldwide. The processes of neuronal production, migration and synaptic connections in the developing brain that he identified have been implicated in developmental disorders of childhood onset, such as autism, intellectual disability, among many others. His observations also have informed the understanding of psychiatric and neurologic disorders of adulthood including schizophrenia, dementia, and epilepsy. His pioneering work has set the stage for treatments that hope to target disturbances in brain development and that might have a transformative impact on the lives of patients, families, and society. Thus, his discoveries have enormous implications for public health. Professor Rakic earned an M.D and PhD from the Belgrade University (Former Yougoslavia). He was one of the founding recipients of the Kavli Prize, considered to be the most prominent neuroscience prize in the world. He is a member of the National Academy of Sciences and, American Academy of Science, National Acadamy of Medicine and of numerousforeign academies, including Norway, Spain and Royal Academy (UK). The Connecticut Medal of Science is the state’s highest honor for scientific achievement in fields crucial to Connecticut’s economic competiveness and social well-being. 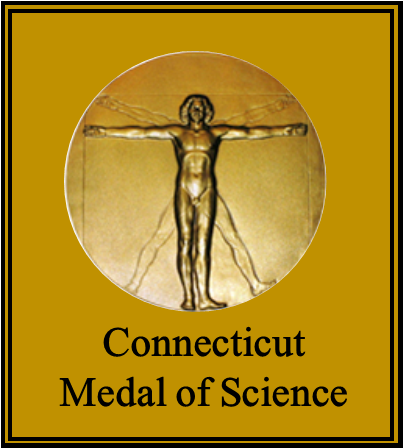 Modeled after the National Medal of Science, this award is bestowed by the State of Connecticut, with the assistance of the Connecticut Academy of Science and Engineering, in alternate years with the Connecticut Medal of Technology. In February, the Connecticut Academy of Science and Engineering (CASE) announced the election of 24 of Connecticut’s leading experts in science, engineering and technology to membership in the Academy. Election to CASE is on the basis of scientific and engineering distinction achieved through significant contributions in theory or applications, as demonstrated by original published books and papers, patents, the pioneering of new and developing fields and innovative products, outstanding leadership of nationally recognized technical teams, and external professional awards in recognition of scientific and engineering excellence. The new academy members will introduced at the May event. The Connecticut Academy of Science and Engineering was chartered by the General Assembly in 1976 to provide expert guidance on science and technology to the people and to the state of Connecticut, and to promote the application of science and technology to human welfare and economic well-being. More information about the Academy is at www.ctcase.org; a list of previous recipients of the award is at http://www.ctcase.org/medals.html .